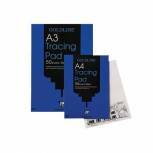 Technik Art Tracing Pad 63gsm A4 40 Sheets XPT4 Pack of 1 Quality 63gsm tracing paper. Ideal for overlays in pen and pencil. 40 leaf pad. Individually shrink-wrapped. A4. 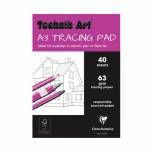 Technik Art Tracing Pad 63gsm A3 40 Sheets XPT3 Pack of 1 Technik Art Tracing Pad. 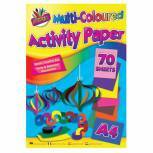 Quality 63gsm tracing paper. Ideal for overlays in pen and pencil. 40 leaf pad. Individually shrink-wrapped. A3. 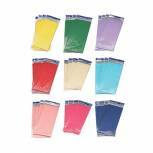 Bright Ideas Tissue Paper Assorted (Pack of 480) BI7830 Pack of 1 Suitable for all craft and packaging uses. 18gsm. Size 520 x 760mm. 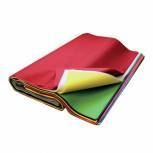 24 sheets of white, cerise, turquoise, apple green, light blue, pink, blue, brown, lilac, lt green, burgundy, black, gold, dark green, dk blue, violet, red, yellow, orange and lavender. 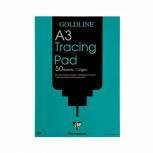 Goldline Professional Tracing Pad 90gsm A3 50 Sheets GPT1A3 Pack of 1 Top quality professional tracing pads suitable for use with both pen and pencil. Each pad contains 50 sheets of 90gsm tracing paper. Size A3. Goldline Professional Tracing Pad 90gsm A4 50 Sheets GPT1A4 Pack of 1 Top quality professional tracing pads suitable for use with both pen and pencil. Each pad contains 50 sheets of 90gsm tracing paper. Size A4. 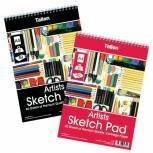 Goldline Professional Tracing Pad 90gsm A2 50 Sheets GPT1A2 Pack of 1 Goldline Professional Tracing Pad. 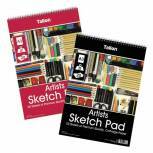 Top quality professional tracing pads suitable for use with both pen and pencil. Each pad contains 50 sheets of 90gsm tracing paper. Size A2. 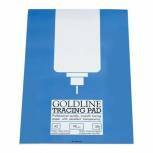 Goldline Heavyweight Tracing Pad 112gsm A3 50 Sheets GPT3A3 Pack of 1 Goldline Heavyweight Tracing Pad. 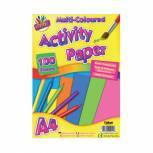 Top value tracing pads ideal for students and general use, can be used with both pen and pencil. Can also be used for overlays for printing instruction. Each pad has 50 sheets of 112gsm tracing paper. Size A3. 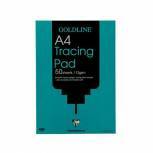 Goldline Heavyweight Tracing Pad 112gsm A4 50 Sheets GPT3A4 Pack of 1 Goldline Heavyweight Tracing Pad. 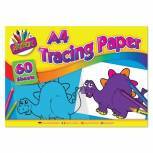 Top value tracing pads ideal for students and general use, can be used with both pen and pencil. Can also be used for overlays for printing instruction. Each pad has 50 sheets of 112gsm tracing paper. Size A4. 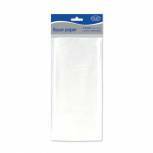 Royal Sovereign Natural Tracing Paper Roll 297mmx20m 90gsm GW012479 Pack of 1 High quality tracing paper for pencil and ink. Hard surface for best tracing quality. Premium 90gsm paper. Width: 298mm. 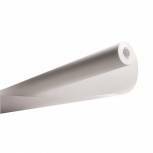 Supplied on 20m roll..
Royal Sovereign Natural Tracing Paper Roll 841mmx20m 90gsm GW012499 Pack of 1 High quality tracing paper for pencil and ink. Hard surface for best tracing quality. Premium 90gsm paper. 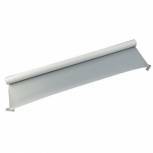 Width: 841mm. 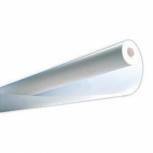 Supplied on 20m roll..
Royal Sovereign Natural Tracing Paper Roll 1016mmx20m 90gsm GW012503 Pack of 1 High quality tracing paper for pencil and ink. Hard surface for best tracing quality. Premium 90gsm paper. Width: 1016mm. Supplied on 20m roll.. 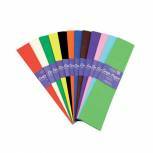 Bright Ideas Crepe Paper Assorted (Pack of 12) BI0568 Pack of 1 Suitable for craft, wrapping and packaging uses. Contains one each of white, pink, purple, light green, yellow, orange, red, dark green, light blue, dark blue, brown and black. 40% creping. Colours will not run if wet. Individual size (L x W): 3 x 0. 5m. 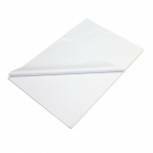 Tissue White Paper 5 Sheets 500x750mm (Pack of 36) CTY08050 Pack of 36 Tissue paper for arts and crafts uses. Perfect for packing delicate items. Can be used as a stylish wrapping paper. Allows you to create textured collages. 5 sheets per pack, 36 packs. Colour: White.